Estate planning is not something that most people (if any) look forward to. After all, no one wants to think about their own mortality. 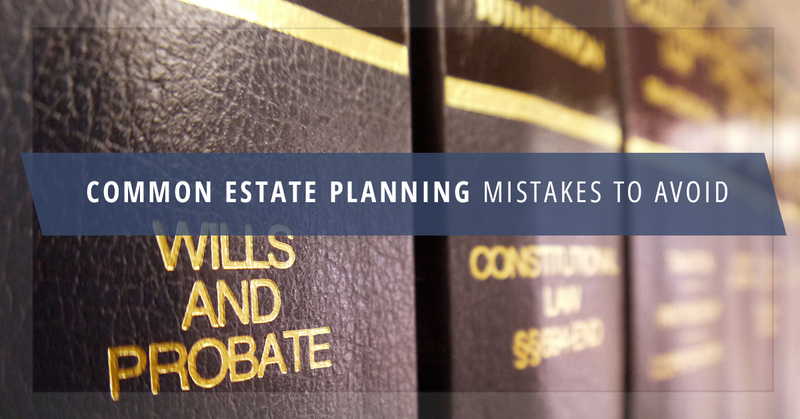 Unfortunately, if you don’t take the time now to plan what will happen with your estate when you’re gone, you could end up making one of these common mistakes. Estate planning isn’t simply putting money in certain accounts; it is a more complex process than that. Fortunately, if you have the correct information, estate planning doesn’t have to be difficult. You should work with a qualified financial advisor, with knowledge of estate planning, to ensure that you avoid these common estate planning mistakes. When it comes to estate planning, many people are unaware of the importance of a will. Wills don’t just dictate who will get what once you pass, like a traditional will; it’s also important to have a living will, which will cover difficult situations in the event of a medical emergency. For example, a living will indicates whether or not you want to be taken off life support. When you take the time to prepare a will, you ensure that your wishes are heard, even if you can’t express them verbally, same with a living will. No matter how much money you have, it’s important that you prepare a traditional will that clearly states the rightful beneficiaries of your assets to hopefully prevent disagreements between your family members after you’re gone. You don’t have to wait until you have already passed away to gift your assets to your loved ones. In fact, there are several benefits to beginning to give within the annual gift tax exclusion limit each year. This can reduce the amount of taxes that need to be paid by your estate after death, and you are also given the opportunity to see how your beneficiaries use your assets (and whether or not they should be really trusted with them). If they spend irresponsibly, you could set up an incentive trust for them. Using your lifetime gifting exemption amount may be an option too if your estate is large enough. Circumstances change over time, and the person who was the beneficiary of your retirement account may be no longer accurate, particularly if they have passed before you. If this is the case, it is imperative to fill out a new beneficiary designation. Otherwise, the beneficiary will fall to the default choice according to the retirement account agreement. If this person is deceased, your estate will now face significant legal costs since the courts will have to determine where the asset should go. You also want to be aware of payout options and how they are dependent on whether or not the beneficiary is your spouse. It’s imperative to be careful about which payout option you elect for, as this may be irreversible. If you don’t take care, there can be some significant tax repercussions for your beneficiary. It doesn’t matter how wealthy you are or aren’t; in the majority of cases, life insurance is essential. Life insurance may be indispensable as to replace lost income power of a deceased spouse, and for more affluent households, life insurance can provide necessary liquidity to pay taxes and settle an estate. Keep in mind that you may want to make an irrevocable trust the owner of such a policy for tax purposes. At Advanced Wealth Advisors, our extensive experience in estate planning makes us unique financial advisors in Naples FL. Contact us today to get connected with a skilled financial planner!